Hamburger Buns or Hamburger Rolls - Chocolate Chocolate and More! OK, are they buns or rolls? I think it depends on where you grew up. We always called them buns but hubby calls them rolls. I guess it’s like the old soda, pop, coke thing. It’s a coke or soda around here, even if you’re drinking Pepsi, which I do not. We’re a Coke family all the way. Or tea. In the south when you say you want tea at a restaurant, they’ll bring you sweet tea but go up north and you’d better tell them sweet tea or you’ll be in for a rude surprise. My Italian friends call spaghetti sauce gravy. Took me forever to realize what they were talking about. Around here gravy is brown or white and is smothering meat or biscuits and you sop it up when you’ve finished so the plate looks like it’s been licked clean. 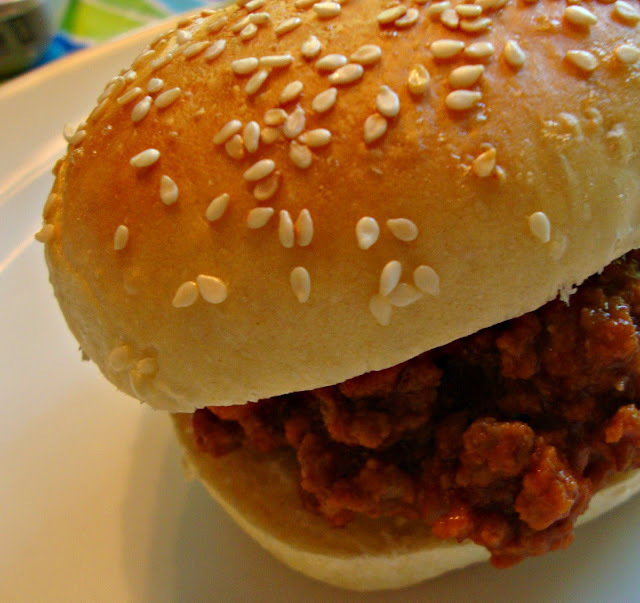 But whatever you call this single serving bread, suitable for a hamburger or Sloppy Joes or even a good sandwich, this one is soft, light and flavorful. I’m so glad I found and tried this recipe. It’s a dump everything in kind of recipe, then mix, rise, shape, rise again and bake. I love these kind of recipes. King Arthur Flour has a wonderful paragraph about how much water to use based on the area you live in, humidity, temperature, blah, blah, blah. Start with the 3/4 cup water and add more if needed till you get the sticky/doughy consistency you’re looking for. Place everything into the bowl of your mixer except 1 egg. Separate the 1 egg and set aside the white for an egg wash. Add remaining egg yolk to mixer bowl. Mix on low until everything is blended together. Now knead dough in blender for about 7 minutes. Or knead by hand for 10 minutes. 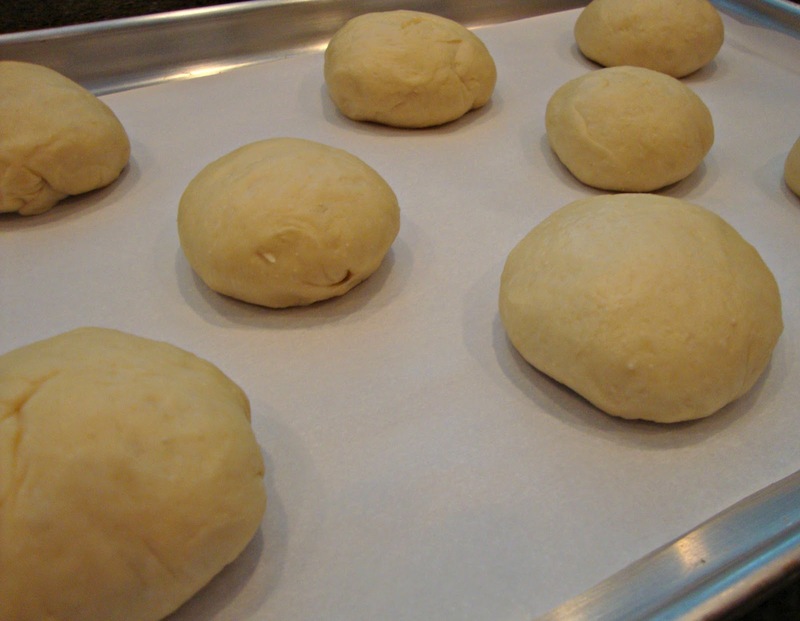 Dough should be elastic in feel with just a slight stickiness. When you pull it away from the bowl or counter, it will stretch and stick just a bit but come away clean. Hope that makes sense. Place in a greased bowl, I used my large batter bowl from Pampered Chef. I don’t work for them and I won’t get anything for giving them this plug but I love these bowls. Let rise until doubled in size, about 1 1/2 hours. 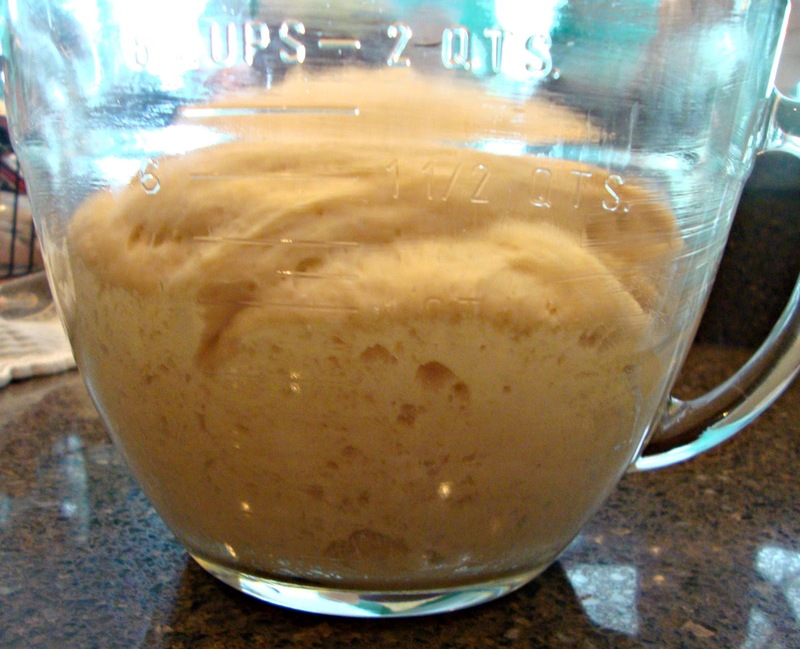 Punch down dough and remove from bowl. Divide into 8 equal pieces. I gently rolled the dough into a log then cut with a sharp knife. Also I didn’t need to flour my surface, the dough was so easy to work with, just roll, cut, rest, roll. Shape into rounded balls, taking time to make sure no creases are showing. Place on greased or parchment lined baking sheet. 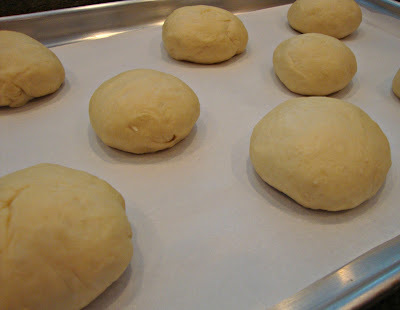 Press down dough with fingers to flatten. Then cover and let rise again for about 45 minutes. Prepare egg wash-add 1 tablespoon water to egg white and whisk till frothy. Brush over rolls and sprinkle with seeds. Bake for 15-18 minutes until golden and perfect. Remove from oven and let rest for 20 minutes before using. We’ll never have to buy buns again! Joan, I love your perfect little buns! (Sorry, I couldn’t resist!) They look so much better than the ones that I buy, which end up totally smushed beyond all recognition by the time I get home from the store. Lesa, thanks for the complement! I’ll take it! These look amazing! I’ve been searching for a winning hamburger bun (not roll ;P) recipe and I think this is it. Pinned! I just pinned this!!! I’m going to try making these!!! Helene, let me know how they turn out. You make them look so darn easy! 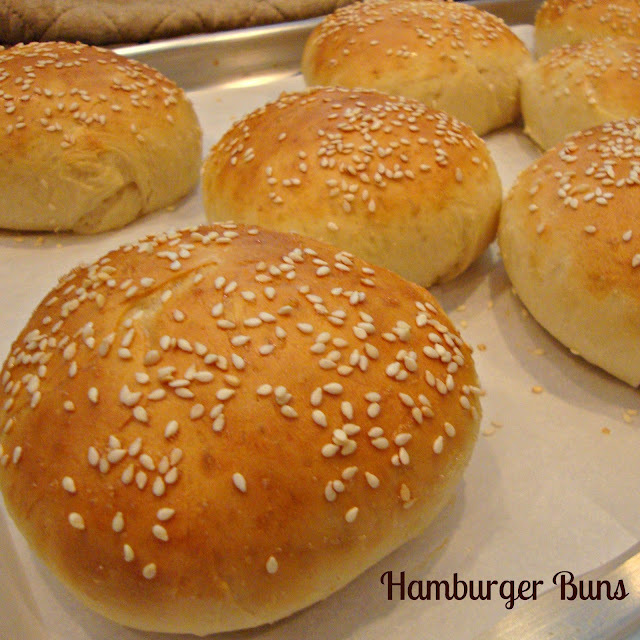 I’ve never tried my hand at hamburger buns (what I’ve always called them), but this recipe may just give me the confidence. 🙂 I’ve got a batch of bread I’m working on now…it’s been a while since I made any. 🙁 I go through stages with my baking…it’s crazy! Your recipe looks awesome. Hope you have a great week end and thank you so much for sharing with Full Plate Thursday. These look incredible! 🙂 I have never even thought about making my own buns! Thanks for sharing at oopsey daisy! Gorgeous! What a wonderful looking buns you have there sweetie! ~smile~ My boys are begging me to make these now. Guess you know what I’ll be doing. Thank you so much for sharing on Thursday’s Treasures Week 31! <3 and hugs dear one! This is a super recipe! It was cold and rainy yesterday and I didn’t feel like going out in the weather to buy some rolls. But I needed them! So I remembered pinning this recipe and fortunately had the necessary ingredients. The rolls turned out great – better than bought ones, for sure! Thank you for sharing the recipe.